I’m not even going to try to be cute with my post title today. I am much too excited. My birthday present has arrived (thank you Mom, Dad, and Darrin)! Want a peek? 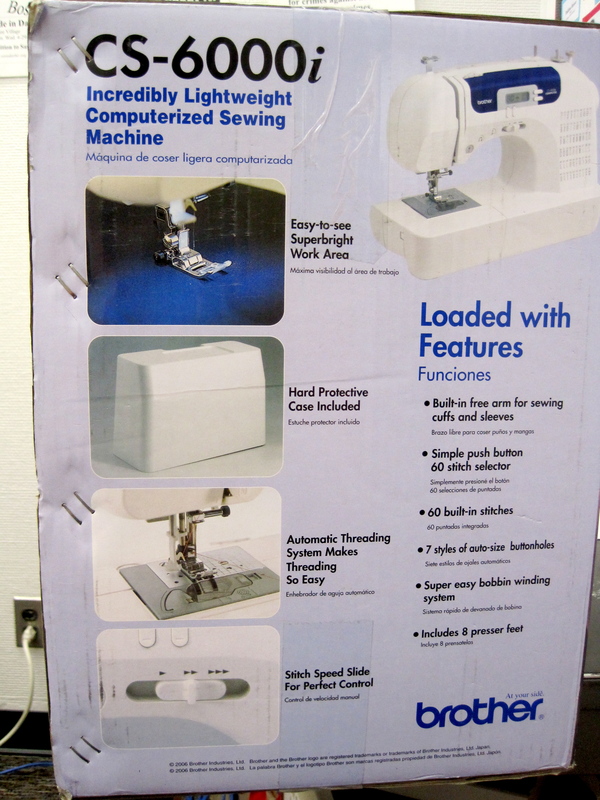 That’s right, folks – I got a sewing machine! Are you as excited as I am?! Are you as creeped out by the lady on the box as I am? What is she doing there? Is she simply a happy sewer? Is she supposed to have sewn her purple blouse? Does her photo on the box really move machines off the shelves? I can just picture it. A lone shopper is carefully looking over each machine, reading the boxes for details on warranties and accessories. She stops, her eyes have fallen on the woman in the purple shirt. 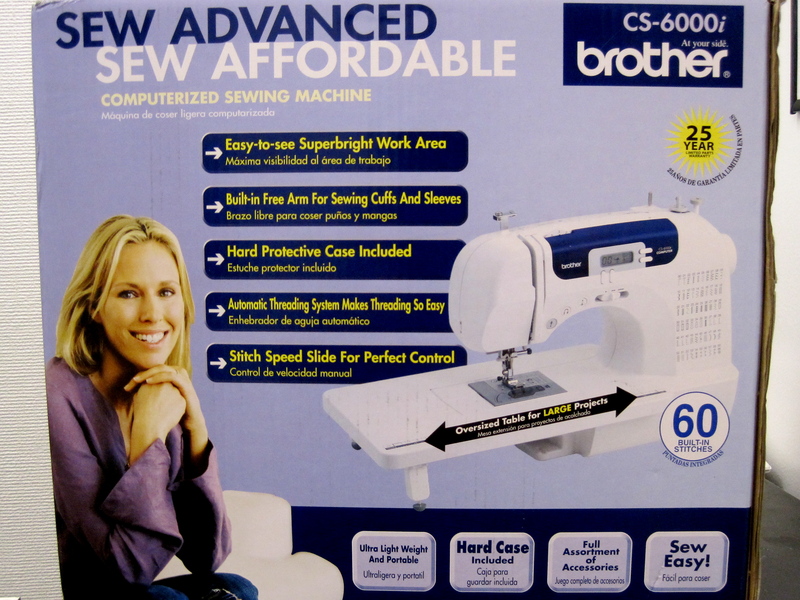 “Oh yeah,” she thinks to herself, “this is the sewing machine for me.” How can she resist that smile, those white teeth, and those hands perfectly placed under the chin? But, I digress. The point is, my machine is in! I first started sewing in 7th grade home economics. My first project was a pillow. I can still picture it. It was a simple white square with “Class of 97” stamped in black across the front. I then went on sewing hiatus until 12th grade when I took a fashion design and costume making class. To this day, I’m still shocked that my high school offered this course. My teacher – shout out to Mrs. San Sebastian – was awesome! She taught us how to sketch designs and turn those into actual patterns. Our class ended up designing and making costumes for the school play (An Imaginary Invalid by Moliere). Fifteen years later and I still remember all these details – that’s the impact this class had on me. I remember even skipping soccer practice a couple of times (well, it was only conditioning and no one likes conditioning) to stay after school and help Mrs. San Sebastian finish up some details on the costumes. I learned so much from her. Since then, my sewing has involved using my mother’s old Singer (I think it’s a Singer anyway) to make Halloween costumes, scarves, and other very simple items. 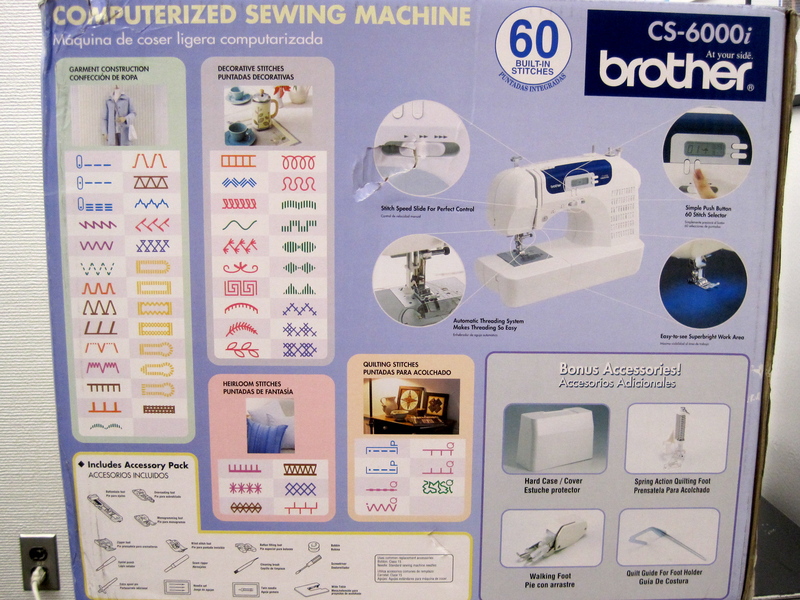 Now that Darrin and I are homeowners, I feel like the lack of a sewing machine is like missing a tool chest. We simply must have a machine in order to get things done in our house. Well, the wait is over! Want some more photos of my baby? Side view. What's that you say...7 styles of auto-size button holes?! Yes, please! What about you? Have you gotten anything new recently that you are bursting-at-the-seems-excited about?